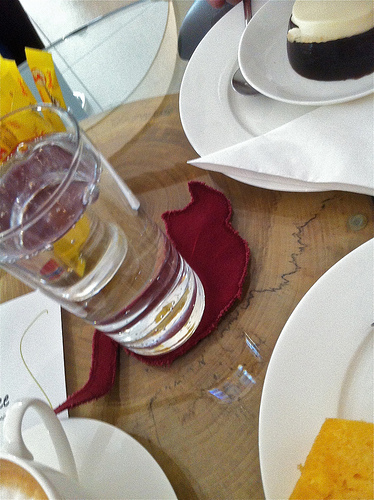 Okay, this cafe might not be typically Austrian, but original it is nevertheless. 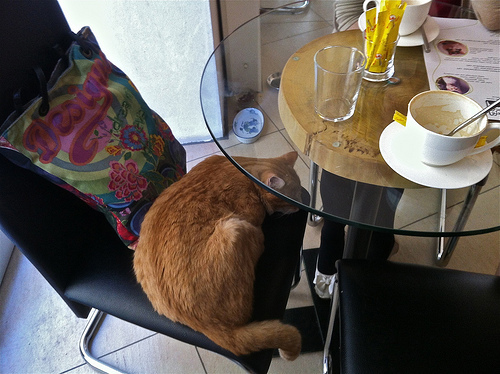 Cafe Neko, which I happened upon on a trip to Vienna is a cat cafe. Apparently these type of cafes are all the rage in Tokyo and springing up like mushrooms, and since spring 2012, Vienna is the proud owner of one as well. The idea is that you have a cup of coffee and a sandwich in the company of resident cats. In this place it's not the customer who is king, but the cats are. They are draped on the chairs, floors and even on wall fixtures. There are cat toys, cat baskets and of course cat hair strewn all over the cafe. Not only is it a great place to go to for people who can't own a cat of their own, cafe Neko also provides a home for stray cats. The owner of Neko got the cats from an animal rescue shelter and gave them a new home. And what a life they lead here. The punters pet them, play with them and secretly feed them treats when the staff is not looking. I can't say that I remember much about the food as the cats got all my attention. But I do have one tip though: Bring one of those sticky fuzz rollers! Because there's no escaping the omnipresent cat hair.